Successfully Added Ken Xin Da Max8 Power Charger - 10400mAh, IP68, 5V 2.1A Output, Flashlight, LED Power Indicator, Suction Cups to your Shopping Cart. Not only is this power bank capable of taking a beating but with its 10400mAh capacity it can provide plenty of power when there's not an outlet in sight. Love the outdoors but don't want to leave your gadgets behind, get the Max 8 Power charger and keep everything power up on the go. Perfect for camping, day trips, holidays, long journeys or travel this power charger has you covered wherever you go. 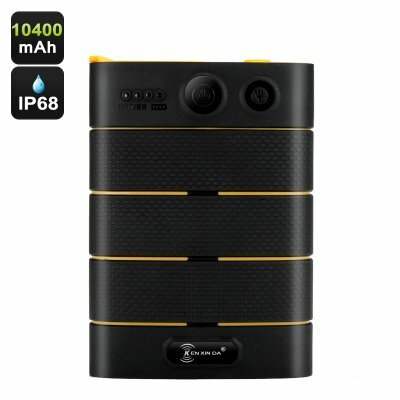 A tough and ready power bank from Ken Xin Da that consists of premium lithium ion battery cells, the Max8 boasts a 10400mAh capacity, which equates to multiple charges for your Smartphone, tablet, camera or speaker and thanks to its 2.1 Amp output you won't be waiting long to top up the power to your devices. The durable rubber outer brings this power pack an impressive IP68 rating, so its impervious to dust and well protected from any water damage with its rubber seal and plugs covering all the ports. This easy to grip power bank is great for those outdoor activity lovers and with 18 mini suction cups on the underside the power charger lets you easily fasten it to smooth objects so it won't slide about when in use. Taking just 5.5 hours to fully recharge this hand help power pack will keep your phone or other gadgets going all weekend and is designed for the harshest conditions. A great gift for outdoor goers and globe trotters who don't want to be off the grid while living life to the max. The Max8 power charger comes with a 12 months warranty, brought to you by the leader in electronic devices as well as wholesale power packs and electronic gadgets..